Playtime imagines a world where a doll like Chucky from the Child's Play franchise is a real-life actor named Billy. 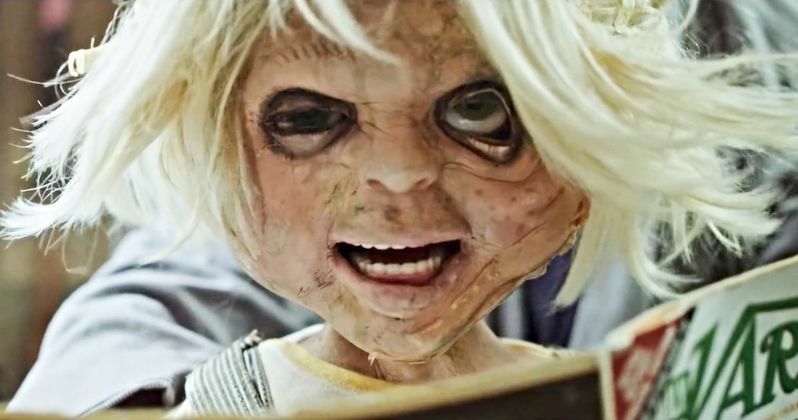 The entire 13-minute short film from Academy Award winning makeup effects shop studioADI is finally online for fans to see after months of teasing out episodes and it's pretty great. Billy had his day in the sun back in the 1980s starring in horror movies, but those days are long gone and Billy is struggling to find work in this modern era where practical effects are replaced with CGI. After being scared of the mailman delivering more bills and eviction notices, Billy opens up an entertainment news publication to find out that they're remaking his franchise, Playtime. However, things aren't exactly going how Billy would have hoped and his eyes are open to today's entertainment industry standards. Billy's rotting rubber face and wonky eyes aren't exactly what Hollywood is clamoring for. On the surface, the movie is about Billy and his struggles in the modern world, but there's a bit more to it than that. Playtime director and writer Alec Gillis also co-founded studioADI and calls the short film autobiographical. Gillis says that the movie is for "anybody who is a practitioner of practical effects trying to kind of navigate in a digital world." Gillis had the idea for Playtime back in 2015 and compared it to a silent film star who wasn't able to transition into making it in the talkie world after several career steps of his own seemed to be leading him down a similar path when going from the practical effects side of things to the CGI side. Going back to the days of 1980s horror, Alec Gillis did not have a huge budget, so he made do with what he had and the results are a must-see for any fans of 1980s horror and practical effects. And while Gillis didn't have much of a budget, one isn't able to tell and wouldn't even have noticed had he not brought it up. Billy looks primed a ready to take over the big screen and It's Playtime could be a feature-length project that many horror fans would go see, especially in the land of reboots and remakes. In addition to being a comment on the practical effects vs. CGI world, It's Playtime also comments on a franchise like Child's Play getting the remake treatment. Kevin Yagher, original designer and executor of the Chucky doll, is even in the movie. He and Alec Gillis are long-time friends who worked together in the 1980s at Stan Winston Studio doing practical effects and makeup. It's Playtime is expertly crafted, but it will certainly leave you wanting more, so hopefully Gillis has his eyes on making another installment. You can watch the entire thing below, thanks to the studioADI YouTube channel.